The legal ecosystem continues to evolve. New competitors, alternative providers, increasing client expectations, emerging technology and a growing emphasis on diversity are challenging industry norms and creating an impetus for change. At the forefront is the client experience, which is influencing service delivery strategies across the entire legal vertical. All of these topics surfaced during HBR Consulting’s 2017 Legal Lab, the third-annual gathering of law firm and corporate law department leaders who came together to collaborate and share ideas on how to pursue innovation and create positive change in the legal industry. The criticality of succession planning for the future. 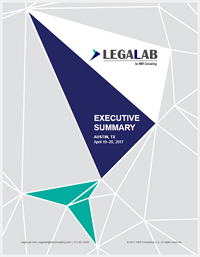 Download the 2017 Legal Lab Executive Summary report for insights into the opportunities and challenges that face legal industry leaders today.